If you are worried about vehicle repossession, you need an experienced attorney who can walk you through the legal process and help you retain your car. Vehicle repossession can be embarrassing and costly. It may impact your ability to care for your family and transportation to work. You may be unsure of what to do if you’ve been threatened with car repossession or your vehicle has already been taken. More Americans are struggling to keep up with their car payments even as other economic indicators may appear to be on the rise. In fact, some experts are saying that the auto loan subprime bubble may be the latest to burst. In 2014, data showed the rate of car repossessions had jumped 70% in the second quarter. If you are in this situation, we encourage you to contact Allmand Law Firm, PLLC to discuss your options. Schedule a complimentary case evaluation with Allmand Law Firm, PLLC to learn more about your options. We serve clients throughout the Dallas / Fort Worth area. In the state of Texas, according to the Business & Commerce Code, the “secured party has the right to claim possession of collateral upon the default of a loan unless other agreements were made in a legal contract.” In other words, your vehicle can be repossessed if you stop making payments. There does not have to be a court order. Although your creditor can take possession of your car without notice, they cannot breach the peace during the vehicle repossession. That may mean making a lot of noise, using physical force to get your keys, or breaking into your garage. If your lender or a company working on their behalf breaches the peace while repossessing your car, you may have a claim against them through a deficiency lawsuit. After your vehicle is repossessed, you only have 10 days to take action before the creditor is legally allowed to sell it. If you are in this position, contact a bankruptcy attorney right away. Our team can help you by filing the required papers. Bankruptcy may be an option for you, but we can also help you with other methods of handling the situation, including relinquishing ownership and negotiating a lower payment. When dealing with vehicle repossession, it’s important that you contact an attorney right away. Although you may think you can handle the situation alone, a lawyer will give you the respect of the car company and courts. Unfortunately, many car companies will disregard an individual who tries to handle a vehicle repossession alone. However, when an attorney contacts them, they will know you mean business. What Happens After Vehicle Repossession? Your lender may either keep your car or sell it to put the money towards your loan. However, the lender must notify you of its actions. You are allowed to know when and where the sale of the vehicle will take place. If you have questions about what happened to your vehicle, a skilled lawyer can help. The lender must sell your car in a manner that is considered commercially reasonable. This involves standard practices and an attempt to obtain the highest price possible. If your lender does not act in a commercially reasonable manner, you may be able to file a deficiency claim against them. What If There Is Still a Balance Left After the Sale of the Vehicle? If you default on a car loan, you may face vehicle repossession. If the vehicle is sold, your lender will apply the proceeds towards your loan balance. However, if the sale of the car does not cover your entire loan balance, you may have a deficiency balance. Your lender may still require you to pay the remaining deficiency balance. Redeem Your Vehicle. If you are able to pay the entire balance of your car loan, you may be able to redeem your vehicle. An attorney can even negotiate with the lender to try to obtain a lower price for full payment. Reinstate the Vehicle Loan. You may be able to pay vehicle repossession costs and bring your loan current, then reinstate your existing loan. Although some lenders will not offer this option, many will. Buy Your Vehicle Back at Auction. You may be able to attend the auction where your lender is selling your car and bid on it yourself. However, you will still have to pay any deficiency balance. File Chapter 7 or Chapter 13 Bankruptcy. When you file bankruptcy, an automatic stay will be put on the lender’s repossession efforts, including auctioning or selling the vehicle. You will have an opportunity to gather necessary money to handle the situation with the lender. did not sue you before the statute of limitations (time limit) established by law. A deficiency lawsuit can be complicated. It requires legal documents, court hearings, and negotiation with the lender. In all of these situations, a vehicle repossession lawyer can help you. Allmand Law Firm, PLLC can handle the legal issues while you try to regain your life. You can have confidence in the team at Allmand Law Firm, PLLC. We have helped tens of thousands of clients over our nearly 15 years in practice. 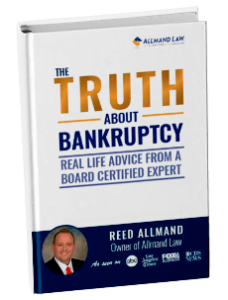 Our lead counsel, Attorney Allmand, has a Superb Rating on Avvo and is certified in Consumer Bankruptcy by the Texas Board of Legal Specialization. You can rely on us during this difficult time. Get in touch with Allmand Law Firm, PLLC today by calling (214) 884-4020. We can help you regain control of your finances.